Campaigner is a solution for both large and small businesses, although many of their most popular services are geared towards the overwhelmed small business owner. Behind the services offered by Campaigner is the company j2 Global Inc., which provides multiple business-related Internet services such as Internet fax, hosted email, online backup, and other CRM services. Their brands are used all over the world by business owners who need to go to the next level without spending a lot of precious time or money along the way. There are two ways to build a campaign within Campaigner. Their templates and layouts are available to get your started, and include plenty of instructions on adding images and links. All of the templates are responsive, and Campaigner does have a media library that will store your images for later use in more newsletters. Their customizable email builder allows you to start from scratch, using HTML to build your own campaign. You can create auto responses and schedule your newsletters to go out at certain times. There’s even a reoccurring scheduler that will send your newsletters without your having to log in. Campaigner’s tracking and reporting tools are similar to many other competitors. You’re given information on the open rate, click rate, replies, unsubscribes, and the ratio of PC users to mobile users. This allows you to easily tailor your next newsletter to the most responsive readers you have. These are all real-time results that can be exported for sharing. The phone and email support offered by Campaigner’s team is always there around the clock, and you get access to webinars as well as a thorough user’s manual that walks you through all the information you need to get started using Campaigner. Some users have found that the live chat support is not as reliable as the phone and email support, but considering their full-time availability, it’s easy to choose the customer service path that works for you. User segmentation within Campaigner is not as customizable as many competitors. They automatically generate segments based on when your users joined your list, and you can separate them even further by their typical response habits, and a few other custom fields. One very cool feature that Campaigner offers where other companies don’t is the “Win-Back”, a template that can be set up to automatically send to clients who haven’t opened or interacted with an email in a specified amount of time. Campaigner is a great solution for small business owners who need flexibility in their newsletter campaigns. 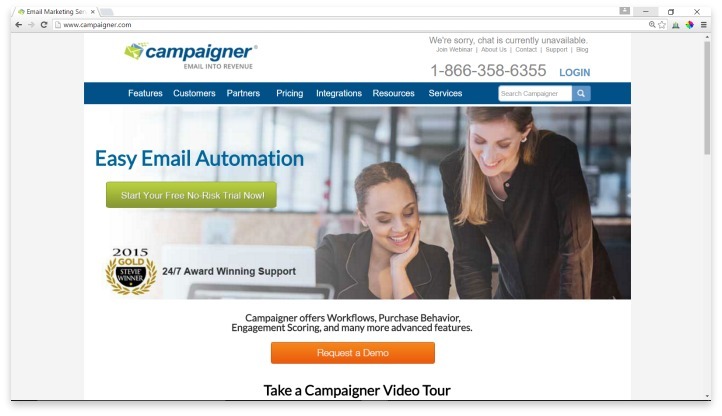 Campaigner is a great solution for small business owners who need flexibility in their newsletter campaigns. You can choose to create advanced emails one month with tons of features and interactive items, and then fall back on a basic, professional template later when your time is at a premium. With their always-available coaching, Campaigner is able to help you identify the best path to grow your business. If you need a company that you can absolutely count on to be easy and intuitive, there are probably better options for you. Have you had an experience with this company? Please share your Campaigner Reviews below.